Gail Anglin and I will be revisiting Stephen Leacock country on June 1st, joined by a third storyteller (the highly entertaining Mary Wiggin!) and gifted pianist Anne Hurley. "Laugh! With Leacock" is a fundraising concert of the Ottawa StoryTellers, a community arts charitable organization with a mission "to promote the art of storytelling in our community, to nurture and inspire both beginning and experienced storytellers, and to provide tellers and listeners of all ages with opportunities to come together to share and enjoy stories." 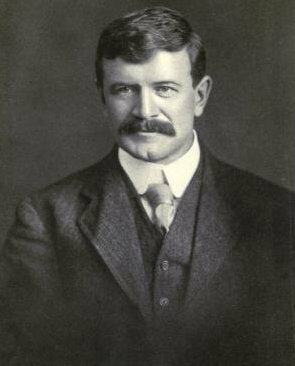 "Canada’s king of gentle humour, Stephen Leacock (1869–1944), was for a time the best-known English-speaking humourist in the world. Three of Ottawa’s funniest storytellers, Gail Anglin, Tom Lips, and Mary Wiggin, present a show guaranteed to bring smiles with retellings of some Leacock classics and lesser-known gems. Whether our hero is braving the terrors of banking, going under the barber’s blade, experiencing star-crossed romance in a little Ontario town, or communing with the Beyond, Leacock has a gift for zeroing in on the all-too-human foibles, fears and follies that beset us all. Adding to the hilarity will be a Selection of Suitable Songs featuring the popular Lips-Anglin duo with accompanist Anne Hurley." Venue: The Arts Court Theatre, located at 2 Daly Avenue in Ottawa’s downtown core (at the intersection of Daly Avenue and Nicholas Street), close to the Rideau Centre. Tickets are $25 and can be purchased at Arts Court or online at http://artscourt.ca/events/laugh-with-leacock/. I'm delighted to participate in the inauguration of a new coffeehouse series in Ottawa on Saturday, May 6th at the Friends' (Quakers') Meeting House, 91A Fourth Avenue, Ottawa. I will be the featured performer in the second half of this charity fundraiser , which includes an open stage, performances by six local artists, and a Tiny Arts and Crafts Show. I understand there will be some bellydancing! Doors open at 6:30 and the suggested donation is $10. Building on a long-held coffee house tradition, the inaugural Friends’ Coffee House will be held Saturday, May 6 from 7 to 9:30 p.m. at the Quaker Meeting House, 91 Fourth Avenue in the Glebe. Doors open at 6:30.
audiences and entertainers. Live folk music is sung, a variety of instruments are played and people sometimes recite poetry. The supportive atmosphere provides opportunities for new talent. And in this informal, relaxing environment new friends are made. The first Friends’ Coffee House will offer both an open stage and a concert. Six accomplished local artists will share the stage during the first half. Acts include a bluegrass guitarist, a poet, a cellist and a duo singing English ballads. Tom Lips will perform a solo concert in the second half of the evening. He is well known to Ottawa audiences. Tom is an accomplished singer-songwriter, poet, author of stories and storyteller. His musical repertoire is eclectic and includes poignant love songs, frolicking protest pieces, gospel and rock. His voice is described as “deep, beautiful, crooning and almost sensual.” With over 300 songs written, he has published two CDs, performed internationally at music festivals and at concerts throughout Ottawa including the NAC’s Fourth Stage. These memorable performances beckon laughter and tears. Coffee, tea and sweets will be sold at intermission and A Tiny Arts and Crafts Show will highlight local artists. Five contributors will be selling small works valued at $25 or less. Admission to the event is by donation of pay-what-you-can, with a suggestion of $10. The money received will be shared, a portion supporting a local charity, the remainder going to the featured musician. Volunteers are organizing the event. Everyone is welcome at this community event. Please join us for a laid-back evening on Saturday, May 6, and if you would like to take the stage at the next Friends’ Coffee House (Saturday, November 4, 2017), just let us know. Heather White has lived and worked in the Glebe for 30 years and is part of a team of volunteers organizing the Friends’ Coffee House. The title of the song “Judgment Day,” from my CD The Devil’s Day Off, alludes to an idea that probably required no explanation to previous generations. 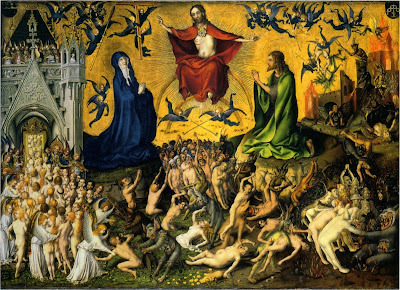 The concept of a final judgment in which the living and the dead will be called to account for the good and evil they have done in their lifetimes is a prominent one in Christianity and other religions. 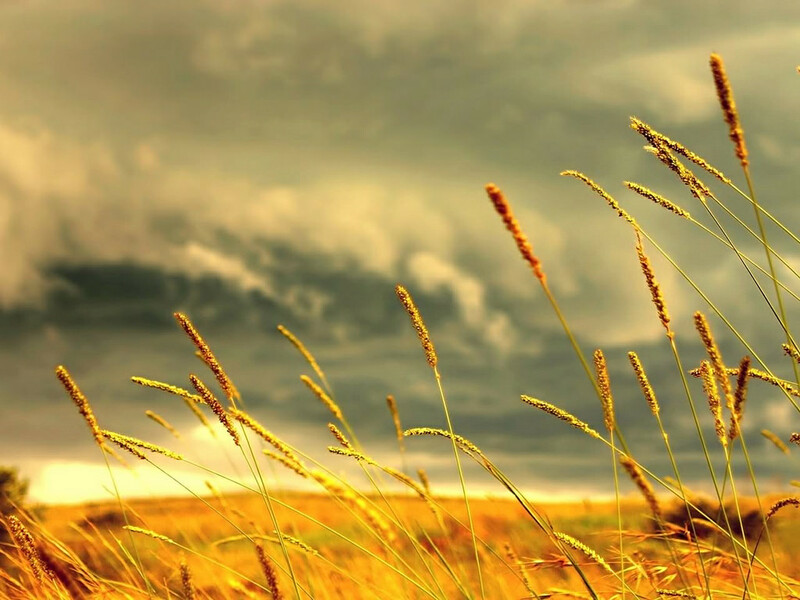 Some believers envision it as an event that happens once, for everyone, at the end of time; others anticipate a judgment that happens for each person at the time of death. Traditional theologies set the stakes very high, i.e. eternal bliss for those who are judged worthy (or at least forgivable) versus eternal damnation for the hardened sinners. 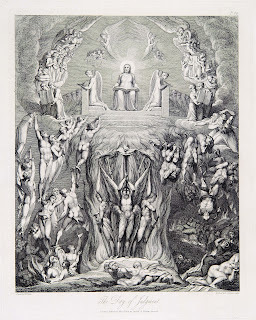 Whatever one’s views are regarding heaven and hell, there is no denying the appeal of the idea that justice, so inconsistently available in the world we live in, is somehow built into the deeper fabric of the universe, so that good or bad behaviour ultimately counts for something. 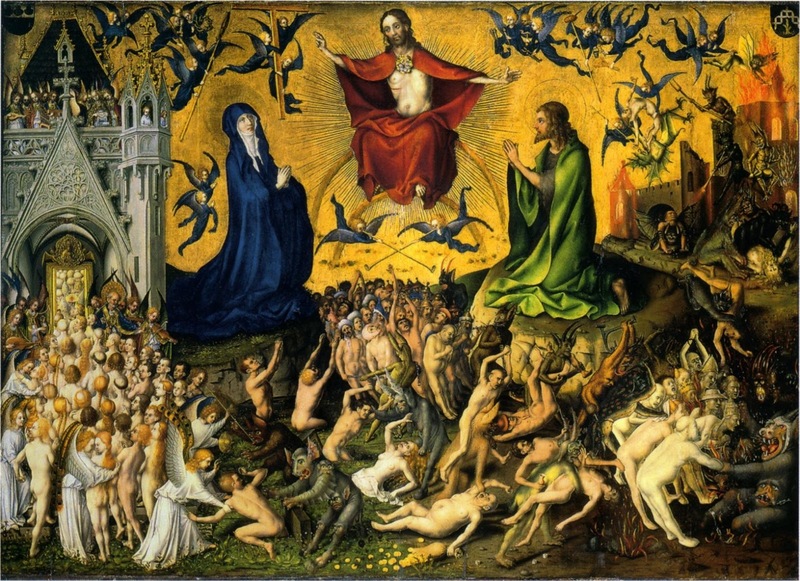 Indeed, unless enough people have that belief in some form or other– unless we have a strong conviction that the good and evil that we do matters– we may find ourselves well on the way to creating hell around us during our own lifetimes. Whether or not there is a final judgment, all of us (with the debatable exception of psychopaths) are subject to the ongoing judgment of conscience, that “still, small voice” that nags at us whenever something we have done or neglected to do clashes with our sense of what is right. For most of us, most of the time, it is pretty easy to drown out that still, small voice with rationalizations and distractions. This can be the case even when the issue is something pretty big. However, when the flow of conscience is plugged, so to speak, it’s possible for the pressure of suppressed guilt to build up until something gives way, resulting in powerful insight, epiphany, repentance, even conversion. I’m convinced that such an experience, if genuine and deep, can change lives in a profound way (though emotional repentances have a depressing tendency to come to nothing once the emotion passes). 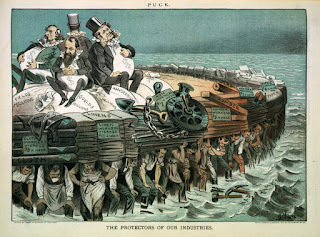 The barons of industry of the 19th and early 20th century included a number of men with roots in Protestant Christianity (Scottish Presbyterians, for example). 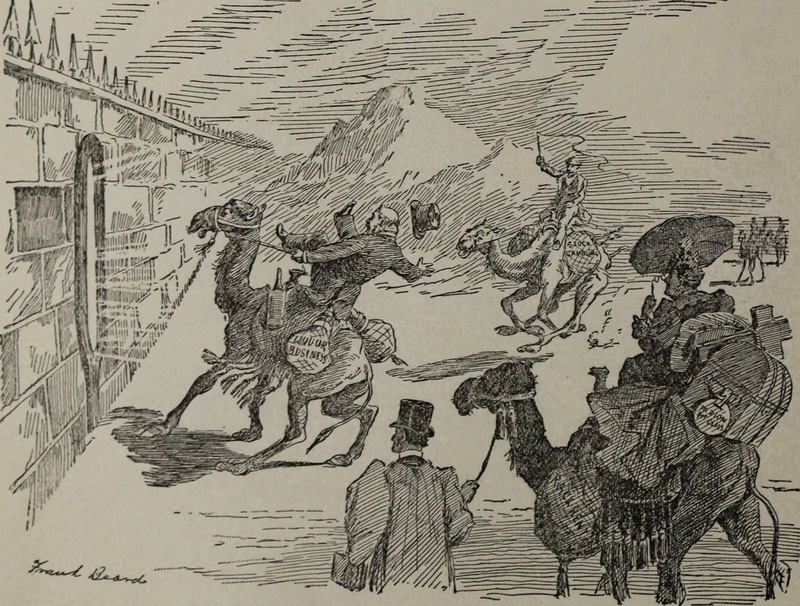 By and large these tycoons were a ruthless, tight-fisted lot, corrupt by modern standards, who appeared to insulate their business practices quite thoroughly from the precepts of the Sermon on the Mount. 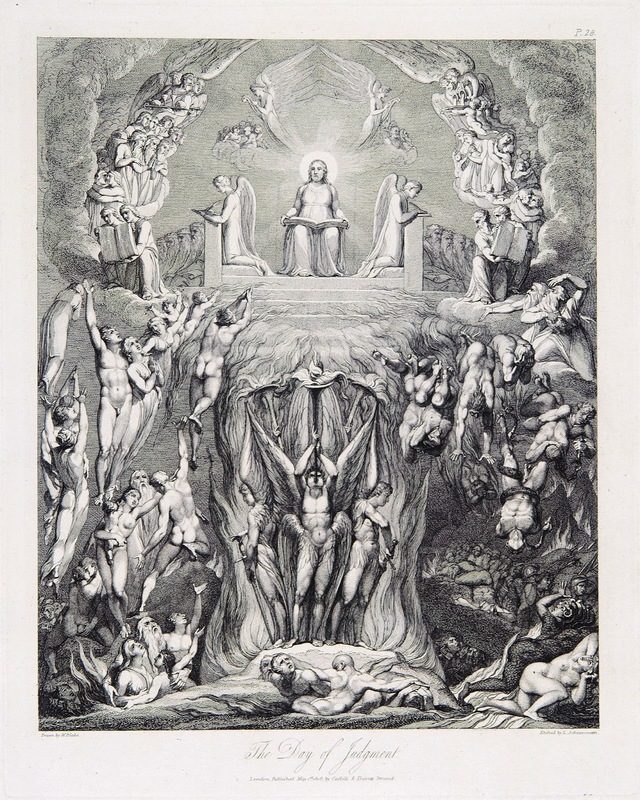 However, the human soul is complex, and in some cases there is evidence that conscience would occasionally break through the avarice and the drive for dominance (at least to some extent). For example, Andrew Carnegie, who levered himself out of poverty through a combination of hard work, insider trading, business acumen and the old boys’ network, seems to have struggled inwardly with the “idolatry” of amassing wealth. That did not prevent him from accumulating the equivalent of $6.5 billion, from consenting to violent anti-union tactics (Homestead Strike of 1892), or from dodging his share of liability for the collapse of a dam of which he was part owner (Johnstown Flood, 1889). At the best of times it is virtually impossible to see into the soul of another human being. 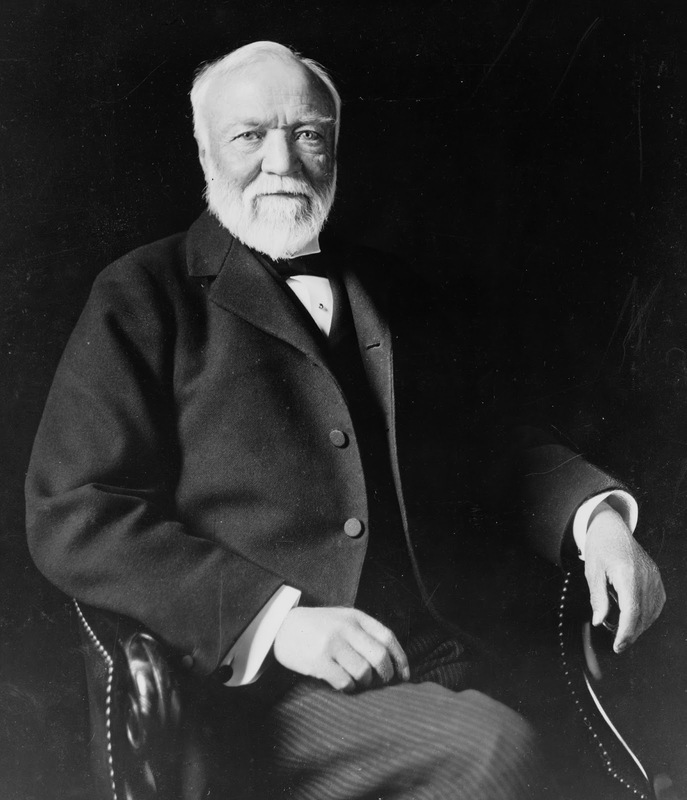 Still, it seems to me that, in contrast with the industrialists of Carnegie’s generation, modern multi-billionaires mostly lack even the vestiges of a spiritual foundation that might help to shift them away from the psychopathy of mere avarice and never-ending conquest. Warren Buffet sometimes shows signs of having a conscience, but he still “doesn’t mix morals with money.” Bill Gates has entered a philanthropic phase, and there are many other rich philanthropists, but it’s not clear what their deep motivation is, and they seem like outliers among the 0.01%. Increasingly it is the corporation that determines the morality of the CEO rather than vice versa, and corporations (despite being “persons”) are incapable of repentance. So we have to hope that humans, pending their complete and final subordination, will find it in themselves to exercise higher moral choices despite the massive downward momentum of corporate agendas. Granted, the odds are never good that the people at the very top of the pyramid will go against the machine that put them there. I am not an experienced creator of videos, so this one is quite basic. I was fortunate to find a good number of appropriate public-domain images to supplement a handful of photos from the family archive. I had fun putting it together, and I hope you'll enjoy it. The CD (or individual tracks) can be purchased in digital form from CD Baby, and you can get the physical CD either from CD Baby or (if you're in Canada) by mail from me. Link to Youtube Video of "The Far Saskatchewan"
On Saturday, January 21st, I get to join three brilliant singer-songwriters (Lynn Miles, Rick Fines and Megan Jerome) for a songwriter’s circle concert. 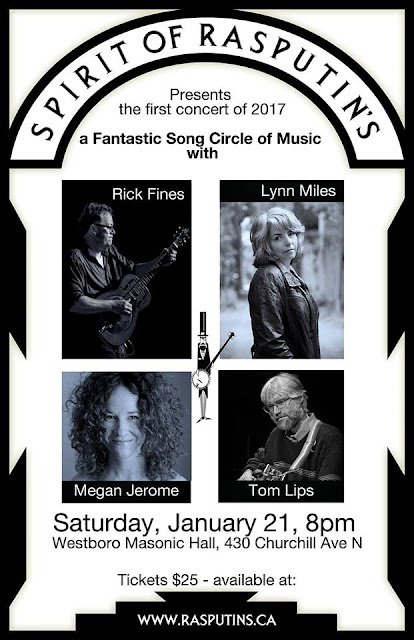 with Rick Fines, Lynn Miles, Megan Jerome, and Tom Lips, on Saturday, January 21st, 8:00 p.m. at the Westboro Masonic Hall, 430 Churchill Ave. North, in Ottawa. 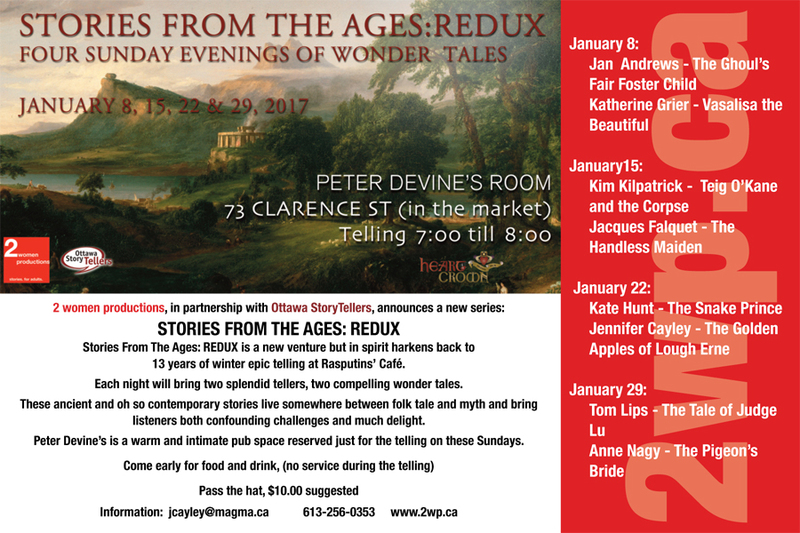 Ottawa fans of traditional wonder tales and epics will remember fondly the winter storytelling series "Stories from the Ages" which was hosted by the late lamented Rasputin's coffeehouse for many years. Epic storytelling for adults, from Homer's Iliad to the Morte d'Arthur, drew fans from across the city. This year, series founders Jan Andrews and Jennifer Cayley, in cooperation with the Ottawa StoryTellers, have launched a month-long series on Sunday evenings that should have strong appeal for fans of the original "Stories from the Ages." I have the honour of performing in the January 29th slot, along with Anne Nagy. 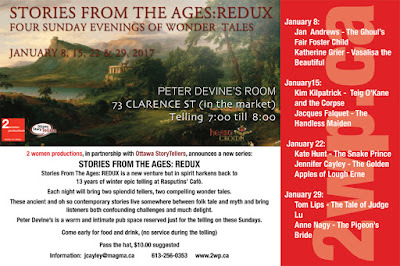 STORIES FROM THE AGES: REDUX – FOUR SUNDAY EVENINGS OF WONDER TALES, at PETER DEVINE’S ROOM, 73 CLARENCE ST, Ottawa (in the market). Telling will take place from 7:00 till 8:00. Come early for food and drink, (no service during the telling). Stay afterwards to chat and think out loud about what you’ve heard. This is a Pass-the-hat event; a donation of $10.00 is suggested. 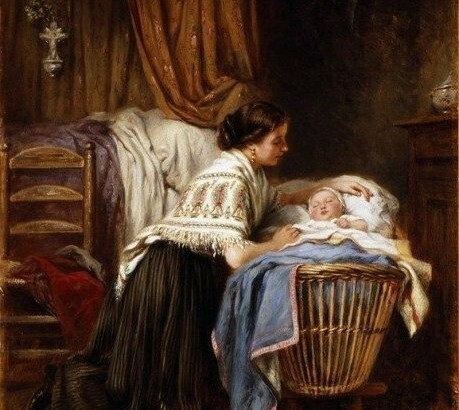 And down will come baby, cradle and all! 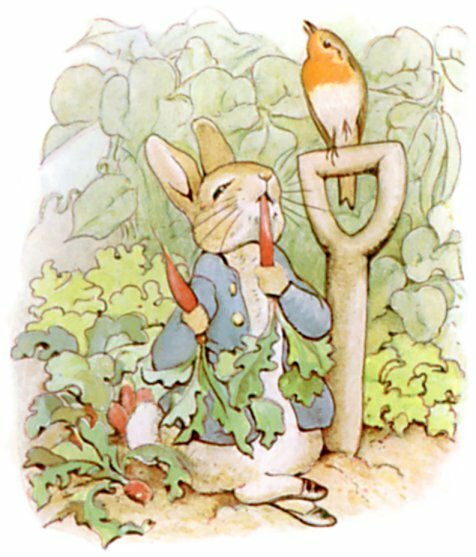 ...which, while no doubt a perfectly acceptable sentiment in a hunting culture, is at least a bit jarring when juxtaposed with Tales of Peter Rabbit. And examples form other countries can be just as dark. 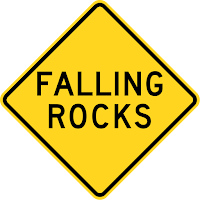 By comparison, “Big Rocks Are Falling From the Blue Sky” is a fairly cheery message for a lullabye. Most children who are old enough to appreciate absurdity seem to get a kick out of it, rather than being scarred for life. I must admit that I have yet to try this song out as a device for settling down a young child at bedtime; I’d be happy to hear from any parents who have made the experiment. 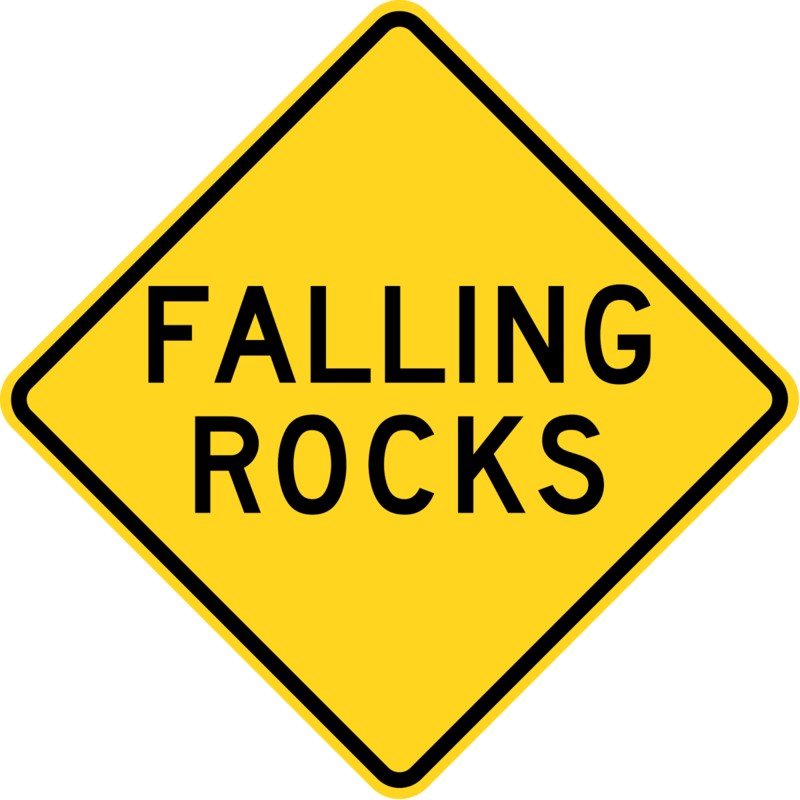 “One of the most well-known cases of falling stones occurred in Harrisonville, Ohio, in Oct. 1901. The Buffalo Express, a small local newspaper, reported that on Oct. 13, "a small boulder came crashing through the window of Zach Dye's house." Nobody was seen in the vicinity. But this was just the beginning. 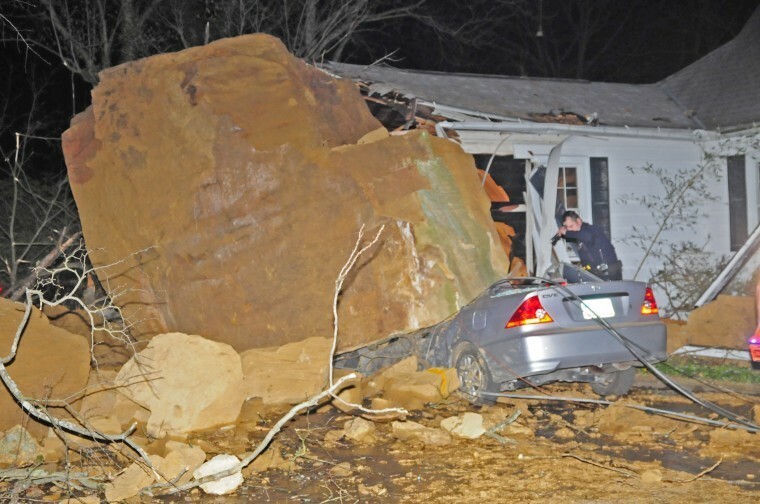 Within a few days, the whole town was supposedly afflicted by stones and boulders falling from a clear sky. 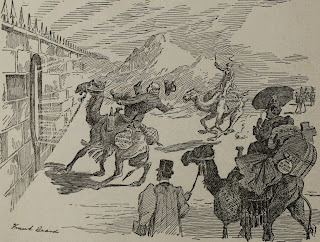 Perplexed as to where the stones were coming from, the townspeople rounded up all the men and boys of Harrisonville to rule out the phenomenon being caused by a gang of trouble-makers (it was assumed that females would not be capable of such as act). The stones continue to fall. Several days later, the rain of stones stopped just as suddenly as it had started. On Wednesday, October 19th, 2016, at the Arts Court Theatre in Ottawa, Jan Andrews and I told the epic story of Gilgamesh, with musical support by Armin Rahmanian on the tar and setar (see previous post). Over 90 people turned out, which is not bad for a storytelling performance of an ancient Sumerian epic going head-to-head with the final Clinton-Trump debate on TV. Now I can give my Facebook friends a break from continual reminders and explanations regarding this important but relatively little-known story (though I guess I will post this blog entry!). My sincere thanks for all who came out: as I have learned again and again, the quality of the listening has an amazing impact on the quality of the telling. Storytelling really is a joint effort between the teller and the listener. On the positive side, the need to consider run-time allowed us, with very little guilt, to cut out many passages that were confusing, contradictory, or incomprehensible. The Epic of Gilgamesh probably began as a cluster of stories which were not entirely consistent with one another, and which merged in the way myths and tales often do, retaining seams and scars and fragments of their former selves. The text has been reconstructed from clay tablets and stitched together with the help of versions in different languages, written down several centuries apart. While most of the story is clear, in a number of places the English translations seem speculative and do not agree with one another. Presumably the ancient Sumerian or Akkadian readers or listeners would have been so familiar with the various back stories and the overarching cosmology that many references which are obscure to us would have made sense to them. What were the “holy things” in Urshanabi’s boat that Gilgamesh destroyed, and why did he do that? Did Enkidu have a wife at some point, or not? Was Humbaba really evil, or are we supposed to feel compassion for him? The story of Gilgamesh’s quest to slay Humbaba is the most puzzling and obscure section of the epic, and the one that caused us the most hair-tearing. 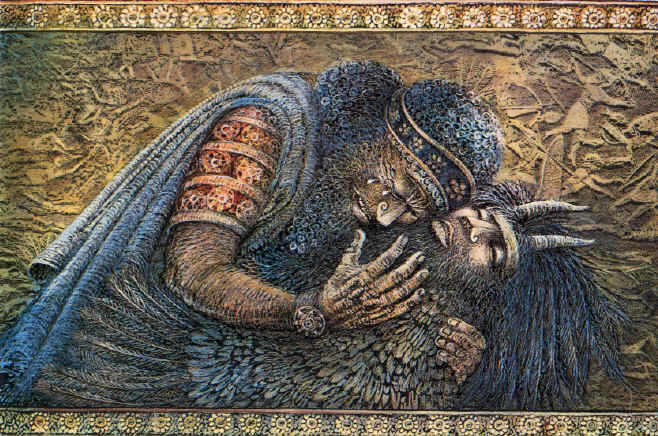 It is lengthy, but (to the modern ear) not very eventful: It cycles repeatedly through a pattern in which Gilgamesh and Enkidu take turns being afraid of Humbaba and reassuring each other. There is a series of prophetic dreams adumbrating the outcome of the battle, and the whole leadup to the encounter with Humbaba risks being tedious and puzzling. After all that, the battle itself is described quite briefly and ambiguously; one gathers that it is a spiritual conflict for which we no longer have the key. Various attempts to make the story tellable finally persuaded us that we needed to give ourselves the freedom to condense this middle part of the epic considerably and to adapt it in ways that would make it work better as an oral story. In exchange for the sizable swaths of the Humbaba story that were removed or vigorously adapted, we allowed ourselves to put back in more of the story of Ishtar’s failed seduction of Gilgamesh and its consequences. It was a good exchange: the catalogue of Ishtar’s love affairs, while somewhat of a digression, is much clearer and more satisfying to tell than the pieces we excised from the Humbaba story. Another challenge was to ensure that the latter part of the epic, from the death of Enkidu to Gilgamesh’s return to Uruk, was more than just a series of dreamlike episodes or a long depressive rant. Our early attempts were, in Armin’s words, “very philosophical,” but somehow not satisfying as a story. We needed to emphasize Gilgamesh’s quest: he is not just wandering through the wilderness grieving, he is relentlessly searching for someone who can save him from death. His sadness over Enkidu is genuine and deep, but ultimately it is superseded by his own obsession with escaping “the common lot of man.” When we focused on this storyline, everything worked better.